The festive season has arrived with a rush of holiday season campaigns centred around Christmas. We’ve wrapped up just a few of the many 2018 Christmas themed campaigns. Network Seven broadcasted the 2018 Melbourne Cup pulling in 1.83 million metro viewers and 2.7 million nationally, which saw an increase in viewership from last year. The Network is known for broadcasting ‘the race that stops the nation’ however recently announced that this will be the final year, following a $100 million deal by Ten to take over the rights. Melbourne Cup Day is recognised as one of the largest gambling days of the year for Australians, and we’ve taken a look at the some of the biggest industry and brand advertisers during the 2018 Melbourne Cup. The Automotive industry ranked in as the highest industry advertisers with Lexus dominating with the most number of tv ad spots. Telfast campaign ‘Break Through Hayfever Allergies’ ranked in as the biggest campaign aired during the 2018 Melbourne Cup with a total count of 98 ad spots. Lexus was the principle sponsor this year, and their campaign ‘The All-New Lexus UX’ ranked in second with a total of 75 ad spots. 5. Ubet - Tappy. The Easiest Way To Bet In Cash. The AFL Grand Final scored in 4.3 million viewers across Australian TV to tune in and watch the match between Collingwood and West Coast. Figures released by Seven Network revealed that Seven’s coverage delivered a metro and regional peak audience of 4.297 million in-home viewers, averaging 3.378 million viewers throughout the game. Looking at TV ad spots aired during the AFL Grand Final, the Automotive industry ranked in as the highest industry advertisers, with Toyota having the most active TV spots. Campaign Name: You Don’t Need Australia’s Best Network… Until You Do. *Disclaimer - Data represented is for ads running during the AFL Grand Final only and for industries BigDatr monitors. Click here to view a full list of industries BigDatr currently tracks. Qantas unveils latest campaign featuring Hugh Jackman, encouraging Australians to "stand up" for equality. The 60 second spot created by Brand+Story agency aims to showcase the airlines commitment to "standing up for a fair go". "We don't all think, look or act the same and that's a huge asset. This video is about celebrating the strength that comes from diversity and why it's one of the great things about the kind of place Australia is," says Vanessa Hudson, Qantas group executive. The campaign will run across social media as well as several of the sporting bodies involved and will screen on board Qantas flights. CrownBet has gone back to its roots to revert back to its original form, Beteasy, after the Federal Court temporarily banned the betting service from changing its name to Sportingbet. The new campaign features brand ambassadors, Ricky Ponting and Nicki Whelan, to introduce the "bigger, better betting experience". Crownbet chief marketing officer, Ed Owens said "CrownBet is setting a new tone and standard in Australian betting and we are ultimately passionate about giving our customers a better way to wager. We hope this campaign will get the whole country excited about a more premium punting experience." Cricket Australia launches latest campaign #WATCHME, created with sports agency Blood UTD to promote the women's season of cricket. The campaign currently is shown through digital channels including 6 and 15 second video teasers with promotions across player's social media channels. From September 1st, a 60 second film for the campaign will be released with a 30 second TVC. We expect to see the campaign run across OOH, and a series of social videos. Fast food chain, Burger King US latest campaign "Chick Fries" draws attention to America's "Pink Tax" where women are charged more for products. The campaign spot shows actual female customers being charged more for a box of fries because they come in special pink packaging. The fries should cost $1.69, however in the ad when the women order the exact same fries, they are charged $3.09 because of the pink packaging. The campaign highlights the unfair number of costs that women have to pay such as makeup, health and beauty products. Search giant, Google could finally set up it's first retail store in Chicago. This would be Google's first ever retail store, putting it in competition with tech gurus Apple and Microsoft. The deal is yet to be finalised but the contract is set to be signed soon, however Google said the company does not comment "on rumours and speculation." Google have a list of gadgets and products, including Google Home smart speaker, the Pixel phone lineup, and the Google Chromecast smart dongle, is extensive and growing. Here's a wrap of June marketing news from around the world! Audi launches new TVC to welcome the women of Saudi Arabia to the driver’s seat. The spot features a couple getting ready to head out on 24 June 2018, the day the driving ban finally ends. The spot, "Doors" created by Thjnk in Hamburg, Germany, shows the couple reaching a parked Audi vehicle, where the wife holds the passenger-side door for her husband before taking a seat behind the wheel. “With this film we welcome the women of the Kingdom of Saudi Arabia to the world of Audi. We are happy to be part of their future explorations and invite them to have lots of fun with our cars,” Jörg Dietzel, head of global creative and sales media, Audi AG, said. Audi's latest campaign is the latest in a series of congratulatory work from brands. After the ban was lifted, Nissan offered driving lessons to women. Sometimes history is written. This time, it is driven. Audi welcomes women of Saudi Arabia to the driver's seat. Google's ad products will be divided up into three major ad products: Google Ads, Google Marketing Platform and Google Ad Manager. Now known as AdWords will become Google Ads serving as the "front door for advertisers to buy on all Google surfaces" including search, display ads, YouTube videos, app ads in Google Play, location listings in Google Maps or elsewhere. Part of the change also includes Smart Campaigns, which will become the default mode for small business advertisers to easily identify actions including phone calls, store visits and purchases. Google Marketing Platform combines DoubleClick Digital Marketing and Google Analytics 360 which acts as the company's analytics tool for marketers. Google Ad Manager is the third product that combines Google's monetisation tools for publishers, namely DoubleClick Ad Exchange and DoubleClick for Publishers. The rebrand is expected to start rolling out in July. Facebook unveils 'Here Together' an eight-week campaign targeting Australian consumers. The social platform is aiming to drive awareness of the changes Facebook has made to protect people's privacy, remove fake accounts from the platform and ensure people have a positive experience using the platform. 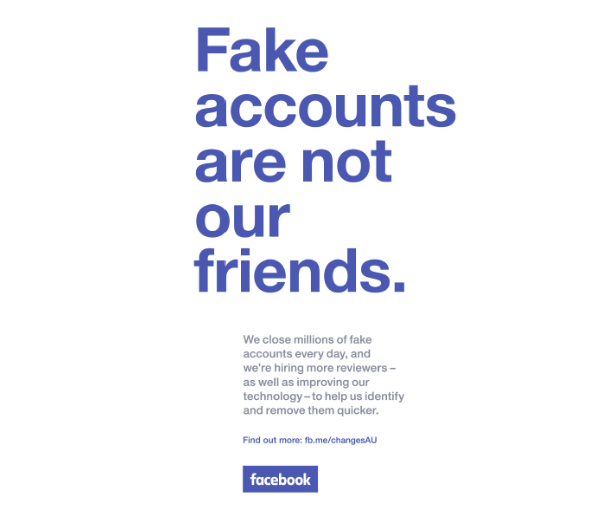 The campaign launched across Australia via OOH, digital, TV and cinema with the hopes of restoring trust in Facebook, informing users about its efforts to combat fake accounts, data misuse and fake news - all of which the social media platform declares are "not our friends". "It is our responsibility to make sure Facebook is a place where everyone can stay closer with the people they care about, and to make sure it's a positive force in the world", says Will Easton, managing director of Facebook in Australia and New Zealand. Optus took out full page ads on page two of newspapers across Australia to apologies for its "monumental stuff up". The telecommunications brand bought exclusive rights to broadcast the World Cup matches live, and football lovers who paid for the sports package offered were left with repeated technical failures. CEO of Optus, Allen Lew apologised to people affected and offered all Australians a free subscription to Optus Sport until August 31st 2018. “Like you, we are football lovers. Our broadcast of the 2018 FIFA World Cup was to be one of our proudest moments. Unfortunately, we let you down. Optus has given SBS the rights to every remaining game of the tournament. Unilever's Dove moves its "Real Beauty" goals further with the introduction of a branding mark indicating its advertising is free of digital manipulation. The "No Digital Distortion" label will kick off across branded content globally starting with Dove's deodorant campaigns. By January 2nd 2019, the mark will be incorporated into all static imagery showcasing women, across print, digital and social, representing the image is not distorted. The 'No digital distortion mark' created by Dove, joins the Self-Esteem Project aiming to inspire women and girls navigate the media landscape letting them know that the image they see has not been digitally distorted. "The Mark will help women identify reality and relieve some of the pressure to look a certain way, which is why we have created a new Evolution Film which reveals the extent of digital distortions and manipulations that takes place in media and advertising and brings to life the issue that women experience, says Dove Global Vice President, Sophie Galvani. Instagram is expanding its shopping features to Instagram Stories, after offering a way for users to shop looks through its feed. The new icon is giving a select number of e-commerce brands a new feature to help with their e-commerce efforts on the platform. Advertisers can add a shopping bag icon to their Instagram story that will display more details about the featured product. Clicking on the shopping bag icon can display various types of product information, including more images of the featured product, images of the other products contained in the story, descriptions and pricing information for the product and links that lead directly to the brand’s website to purchase the product. Nicole Sheffield, former News Corp chief digital officer (of six years) now joins Australia Post as executive general manager, community and consumer. News Corp CMO, Tony Phillips exits to pursue his own consultancy business after less than two years with the company. Jonathan Chadwick is appointed as Carats CEO for the Asia Pacific region. KPMG Australia appoints former Publicis Communications chairman and Publicis Australia CEO, Andrew Baxter as senior advisor to the firm's entrepreneurial customer, brand and marketing advisory (CBMA) business.